I just love tomatoes, so I plant more and more every single year. There are different kinds of tomatoes like classic, cherry and cocktail tomatoes, plum and baby plum tomatoes, vine or truss tomatoes, etc. We have been all experiencing for some time that the orderliness of seasons have changed, so I was delighted with my favourite tomato as early as at the end of July. We had so much produce that I had to think about the way of preserving them. Last year I used only one method for preserving: making tomato sauce. But this year I wanted to be a bit more creative, so I tried several recipes. Scorching summer heat is ideal weather for drying tomatoes. First, I wash the tomatoes and cut the green or damaged parts of the fruit. Then I cut them into halves, put salt on it and dry them outdoors for 1 week (this can only be 3-4 days in present days swelter), but keep the tomatoes in shade and do not expose it to direct sunlight. Moreover, the tomatoes have to be taken indoors for the evening. The best is to dry under mosquito net, because then bugs do not fly on it and we protect the drying tomatoes. Even though I did the necessary precautions, the first go was “destroyed” because of the dogs. So the conclusion is that if we have our pet animal in the yard, then we must put the tomatoes somewhere high that is out of reach for our animals. This is a somewhat more time-consuming process, but without the seeds and the shell, we get a much nicer product. With a good old buzzer I crushed the tomatoes, although even assembling the machine needed some skills and practice. 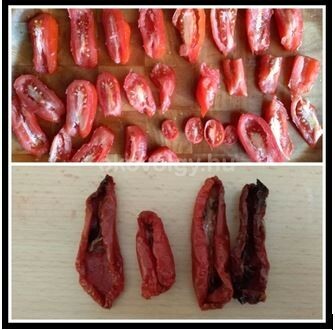 I put the washed tomatoes in hot water, then peel the skin and crush them. Then put the still warm purée into the jars, and after put the jars in a box and cover it, so that they cool down slowly. I never use preservatives, but just sterilize the bottles well – washing them thoroughly and then putting them in a hot oven. At the end one has to cover and leave the jars to cool down gradually. Freezing is the simplest method, and the easiest is to freeze small cherry tomatoes, because they do not occupy much space. I just wash them and put them as a whole in the freezer. This year I tried another method. First I poured hot water on the tomatoes, and then peeled off the skin; at the end when the tomatoes cooled down I put them in small boxes. This does not require really much space as the tomatoes shrink. 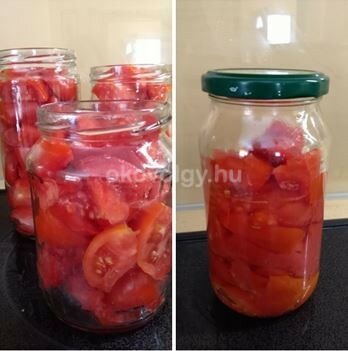 This procedure is so simple that I just wash the tomatoes, cut them and put them in jars. Then after putting the lids on the jars and closing them tightly, I place them in a water-filled bowl and start boiling it. After approximately 15 minutes, I take the bowl off the fire and let it cool slowly. 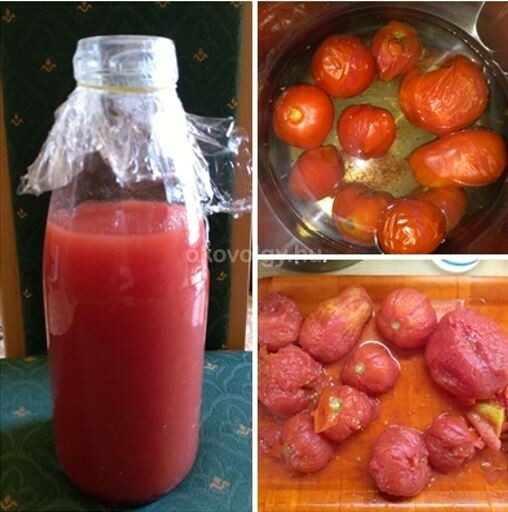 The preserving is ready, you can put the jars in the pantry and in a few months, when there is no fresh fruit, you can prepare delicious food with raw tomato preserves. I wish everyone great success with the different methods of preserving! Of course, this is just a few of the many processes, but the point is not to lose even one tomato, but save everything.